I tarry, haunted by the sight. And prancing patterns on the snow. Echoing all around, a dare. I leave the phantoms to the day. This is the first paragraph of a story that’s been floating around in my head for a while now – it’s a fairy tale … a bit different for me… though I’m not sure yet just which fairy tale. Anyway, I don’t have time to write it right now, as I’m pretty busy with various other projects, but I thought I’d put it out here and maybe you, dear Reader, could leave some sort of inspiration in the form of a comment? I believe that all this nonsense started with my christening, although some might argue that I was doomed from the day of my birth. I was the youngest child and only daughter of the Chieftain of Alagonia. I had three elder brothers, the youngest of which was fully ten years my senior, and they all doted on me from a young age and probably did their best to spoil me. Had I been any more inclined towards vanity, I probably would have soaked up their attention and been quite intolerable. As it was, I took their regard for granted, but never allowed it to go to my head. Of all the books that I’ve gotten through the blogging review program, this one has to be up near the top of my list. Some of you may remember the blog post I did a while back concerning why I believe dragons once actually existed? Well, apparently I’m not the only one. 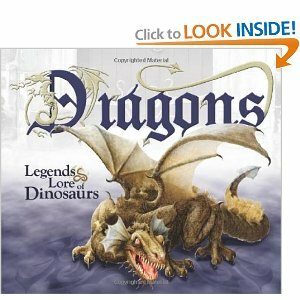 This book combines all sorts of facts from history with many legends about dragons with verses from the Bible that indicate the existence of dragons at one time (many of those verses are the same ones I used in my post, which you can read here). However, all that is not why I love this book. I love this book because it is so cleverly constructed. With text at an elementary or jr. high reading level it clearly explains that dragons and dinosaurs may have been one and the same type of creature, making dinosaurs seem even more intriguing than before. It boasts amazing illustrations that even a very young child will be fascinated by. Beyond that, this book has something fun and “hands-on” to do on almost every page. Page two boasts a page covered in six little envelopes, each with the name of a different country or realm on it (Babylon, Greece, China, America, United Kingdom, and South America). Inside each envelope is a folded piece of nice, glossy paper. Unfold this paper and you can read about a dragon legend that exists (or existed) in that part of the world. This trend of opening things, lifting flaps, and unfolding pages continues throughout this short, 22-page book. The true test? My 2.5 year old daughter loves this book. And although I don’t let her play with it unsupervised, it is interesting enough that I love reading it to her. (Even if I just read her a paraphrased version, or narrate the pictures for her). Many thanks to New Leaf Publishing Group for providing this book for review. They did not ask for a positive review, just an honest one. Many thanks to them for their patience as well, as this review should have been up months ago. As of yesterday morning, The Dragon’s Eye has been pulled out of circulation (there are, of course, still copies available for the moment through amazon, but only a limited number of copies). I went to my account and changed its status to “incomplete” in preparation for the new version. It was an oddly bittersweet moment. I mean… the version that is out there is nowhere near as polished. It’s not as well thought-through. Certain characters are not as well developed. What I’ve done in the past year and a half with re-writing and editing has really changed the feel of the book. It’s still the same story, but there’s a lot more depth there now. There’s a direction to the book, which makes sense, since the first version was written before I knew the book would turn into a quadrilogy. I did no outlining for the first book, I had no idea where it was going, I just wrote 10 pages every day and let the story lead me wherever it wanted to go. It was a great ride… and it taught me a lot about writing. It taught me the value of outlining… a great author (I can’t remember who it was, it might have been Terry Brooks) once said that you’ll either do the work at the beginning of the writing process or at the end… but you’ll do the work either way. I love the surprise of letting the story twist and turn on its own, I love the not-knowing exactly where I’m going to end up… but I don’t love the re-writing that inevitably follows that sort of writing. I’ve since learned that your story can still surprise you, even with an extensive outline to follow. In the midst of the writing process, a character may show up where you didn’t expect him to be, and you decide on the fly that it’s better this way than the way you had it in your outline, and that’s just fine. If I’m honest with myself, now that I’ve done all this re-writing, I’m a little embarrassed of the first edition. And yet, it’s my first edition. The first truly book-length novel I ever wrote. The first book of mine I ever saw in published format. A lot of hard work went into it getting it written, having a friend design the cover and edit it. I will keep a copy of it on my shelf. But it’s time to say “good-bye” to The Dragon’s Eye, because I’ve moved on as a writer. I’m no longer a 19-year old college freshman, and I no longer write like one. This book is the first of a quadrilogy, a series of four books in which my writing style improved and grew and in which I found that all-important writer’s “voice.” I had to do the re-write to get it up to the standard of the rest of the series. Perhaps if it were a stand-alone I could have let it be. But it isn’t, so I can’t. But it is gone, sort of. Although the characters and the story are the same, so much of it is different inside now that it feels brand new to me. The book isn’t The Dragon’s Eye anymore, it has truly become a totally different book: King’s Warrior. So keep an eye out, because my goal is to get King’s Warrior published this fall and into circulation in time for the holidays! (And maybe a mid-West book tour!) I’ll keep you posted on the details of all that, never fear.